Donal O’Shea, an internationally renowned mathematician, has been president of New College of Florida since July 1, 2012. Upon coming to New College, O’Shea embarked on an ambitious four-year plan aimed at increasing academic excellence, enhancing the proportion of tenured to visiting faculty members, enhancing diversity and student life, and creating ways for undergraduates to link liberal arts with the world of work. The plan resulted in the creation of the Center for Engagement and Opportunity, an integrated office for fellowships, internships and career planning, and programs such as the partnership with the Daughters for Life Foundation, that increased the number of international students attending New College. O’Shea oversaw the rebuilding and renewal of the College’s student affairs operation and its advancement arm, the New College Foundation. He secured funding and oversaw planning for a new science building, now under construction and nearing completion, and led the development of New College’s cutting-edge master’s program in Data Science, its first graduate program. He is currently spearheading a project, unanimously endorsed by the Florida State University System Board of Governors, to increase the enrollment of New College by 50 percent, with commitments from the state to fund proportionate increases in faculty, staff and facilities. A firm believer in collaboration, O’Shea has been a leader in developing a consortium of local colleges and universities in the Sarasota region to expand opportunities for all students and faculty. He serves on the boards of the Chambers of Commerce of Bradenton and Sarasota. Well-known nationally in higher education circles, he is the immediate past-president of the Southern University Conference, a group of more than 75 prestigious colleges and universities in the South. He is an executive board member of the Florida Association of Colleges and Universities and is on the strategic planning committee of the national Council of Public Liberal Arts Colleges. O’Shea continues to study mathematics with collaborators around the world. His research interests center around singularities of higher dimensional algebraic surfaces — work which mixes algebraic geometry and differential topology and geometry. He is published in a number of applied areas, including medical imagining, phase transitions, and mathematical physics. He has won numerous awards for his work, most in recently in January 2016, when a groundbreaking, now classic, book he wrote with colleagues David Cox and John Little was awarded the coveted Steele prize for exposition by the American Mathematical Society. Born in St. John, New Brunswick, Canada, to parents who had emigrated from Ireland, O’Shea grew up there, as the oldest of three children. Academically talented, he attended Calasanctius Preparatory School, a school in Buffalo, New York, run by priests of the Piarist Order, refugees from Hungary. 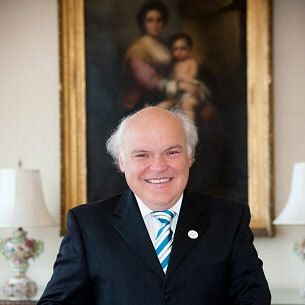 After completing his undergraduate degree at Harvard in 1974, O’Shea returned for graduate work at Queen’s University, a Canadian Research I University, where he earned his doctorate in Mathematics in 1981. He has taught and lectured at universities on almost every continent. Prior to joining New College, he was the dean of faculty and vice president of academic affairs at Mount Holyoke College (the world’s oldest women’s college) in Massachusetts for 14 years. He is married to Mary Barker O’Shea. They have four children, Seamus, Brendan, Sarah and Kathleen, and seven grandchildren.